When Google Buzz for mobile launched in February, we created the mobile web app at buzz.google.com so you could post buzz on the go. Depending on your inbox integration settings buzz gets sent to your Gmail inbox when people @reply you, comment on something you’ve posted, or comment on a post after you. 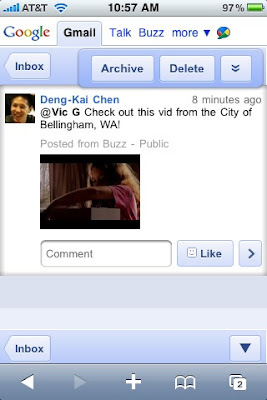 With the latest iteration of Gmail for mobile, we’ve worked to integrate buzz with your mobile inbox. Now, you’ll see buzz in your inbox on your phone just like you do in the desktop version of Gmail, complete with the little Google Buzz icon. When you open a buzz post from your inbox, you can perform all the standard functions, such as liking the post or commenting, just as you can from the desktop Gmail inbox. To try this out, simply go to gmail.com in your iPhone or Android browser. When it will integrate with my iPhone, I mean really? Juhani is right. I'm gonna keep beating the dead horse until Google does something about it. We need location-photo buzzes on the iPhone. Seriously!!! I'm curious why the gmail android app isn't being updated in this way? When, oh When, will we get Buzz on the BlackBerry?!?!?!??? When do you suppose you'll come out with a real windows mobile gmail interface? am using google's nexus one and it does not support this. you mean i have to use the browser instead of the native gmail client on nexus one. There are apps that wrap Gmail for the iPhone that make this a little easier than using the browser, like iGmail, GmailApp, and Mailroom, that keep you signed in, etc. But they're still the native Gmail interface, so no location photos, etc. i have to agree with a few others when are we gonna see buzz for blackberry! I want Search with VOICE for Google Chrome ... so awesome ...please, please! Don't expect the onboard gmail app on Android to support this before y'all get updated to Froyo. Because Gmail isn't an App at this point, it can't really be updated individually. But I understand there will be more of that separation in the future. Just tried this on my G1 and no Buzz integration. Just GMail, Talk, Web, and "more". Only sign of Buzz is if I drill down through the "more", and then I get the usual "Sucker! You have a G1, so no Buzz support for you." message. No Gmail native app for Windows Mobile, much less Google Buzz! I hate it! It's not working on Android 1.5. Tried and could not locate any Buzz in the inbox, in mobile view as well as in desktop view. Does this work on Android 1.5 browser? What is the difference between this and the android google buzz widget?